Let there be some pretty cool light with these plug-in pieces. They’re real attention seekers. ON WALLS, FROM LEFT Walls in Dulux Okarito, dulux.co.nz. It’s Neon Love lights by Neon Poodle, $265 each, teapea.co.nz. Macrame wall hanging by General Eclectic, $199, shutthefrontdoor.co.nz. Eye! Eye! Eye! lights, $528, electricconfetti.com. ON FLOOR, FROM LEFT Felt stone and bowls by Muskhane, from $59 each, teapea.co.nz. Woven stool, $210; ceramic vessel, $65, alexandcorban.co.nz. Hemp Silver Stripe rug, $199, shutthefrontdoor.co.nz. Peyton bed, $299/king single, freedomfurniture.co.nz. Pom Pom cushion, $50; Moroccan cushion, $65; Joni Square cushion, $60, shutthefrontdoor.co.nz. Fitted sheet by Flax Linen, $140, alexandcorban.co.nz. Knitted throw by Amy McCarron, $1500, teapea.co.nz. FROM LEFT Wall in Dulux Blackwood Bay, dulux.co.nz. Popcorn pool float, $58, thirddrawerdown.com. Pear and apple cushions by Made by Mosey, $40 each, afdstore.co.nz. Banana pillow, $110, thingindustries.com. Corn Cob stool, $143, thirddrawerdown.com. Typo turkey leg artwork, $8, cottonon.com. Pineapple neon light, $99, shutthefrontdoor.co.nz. Rug by Evie Kemp, POA, eviekemp.com. Watermelon tote by Bando, $45, shutthefrontdoor.co.nz. Peyton bed, $299/king single, freedomfurniture.co.nz. Lolly Bag quilt cover, $159, and pillowcase, $39, by Kip & Co; watermelon cushion by Made by Mosey, $40, afdstore.co.nz. Circus floor cushion, $94, gormanshop.com.au. 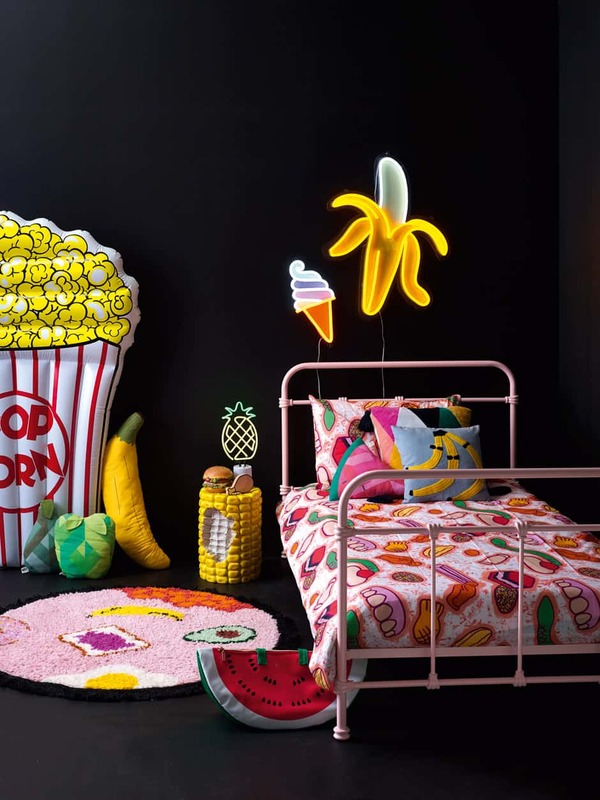 Cool Bananas cushion cover by Bando, $69, afdstore.co.nz. Soft Serve light by Kip & Co x Electric Confetti, $316, electricconfetti.com. 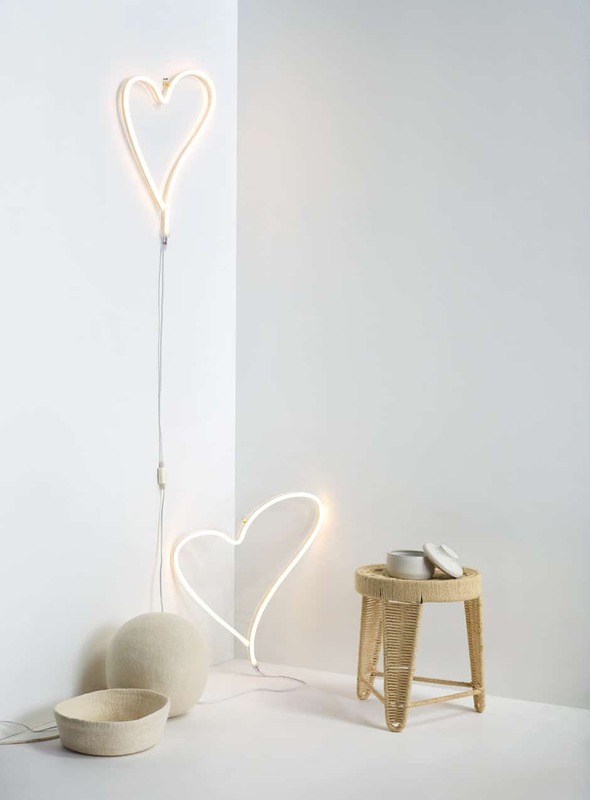 Banana light by Kip & Co x Electric Confetti, $947, afdstore.co.nz. Hamburger money box stylist’s own. FROM LEFT Walls in Dulux Okarito, dulux.co.nz. Skeleton prop, $126, firstscene.co.nz. Wire LED Garland fairy lights, $65, cittadesign.com. Estetico Quotidiano The Pan art object, $115, and Bouche Neon lamp, $320, by Selab x Alessandro Zambelli, seletticonceptstore.com. Canvas cosmetic bags by ECD, $25 each; Cross coasters by Milk & Sugar, $5 each, superette.co.nz. Candles by Alchemy Produx, $41 each, gormanshop.com.au. Estetico Quotidiano The Small Container, $69, and Estetico Quotidiano The Large Container, $107, art objects by Selab x Alessandro Zambelli, seletticonceptstore.com. 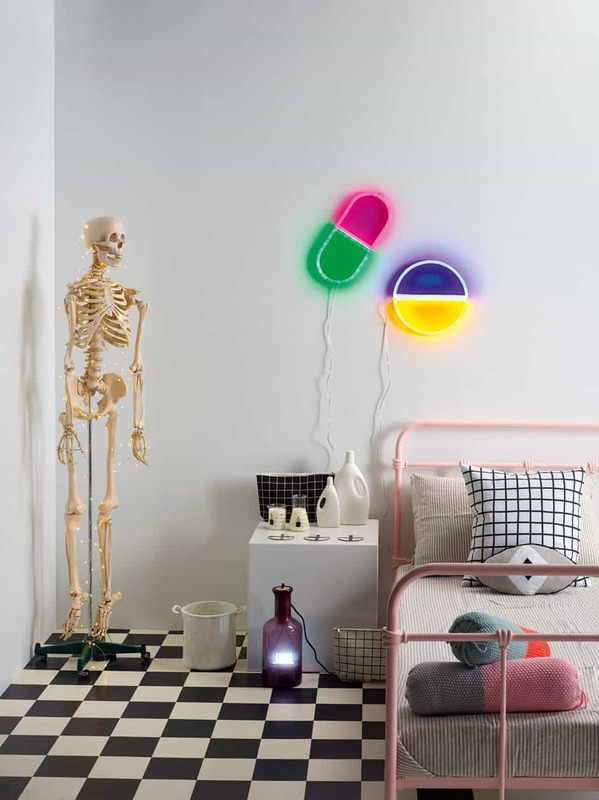 Happy Pills lights by Alex Fulton Design x Electric Confetti , $395, afdstore.co.nz. Peyton bed, $299/king single, freedomfurniture.co.nz. Pillowcase, $70/pair, and duvet cover, $250/queen, by Flax Linen, alexandcorban.co.nz. Grid cushion, $65, shutthefrontdoor.co.nz. Eye cushion by Made by Mosey, $50, afdstore.co.nz. Capsule cushions by Arro Home, $39 each, afdstore.co.nz.